These posts are intended to share information and ideas about climate change and hence act as an open thread. This post has emphasised science, observations and impacts. Comments, about science, observations impacts, and future predictions are welcome. I do not, however, want a rehash of whether human activity causes climate change. 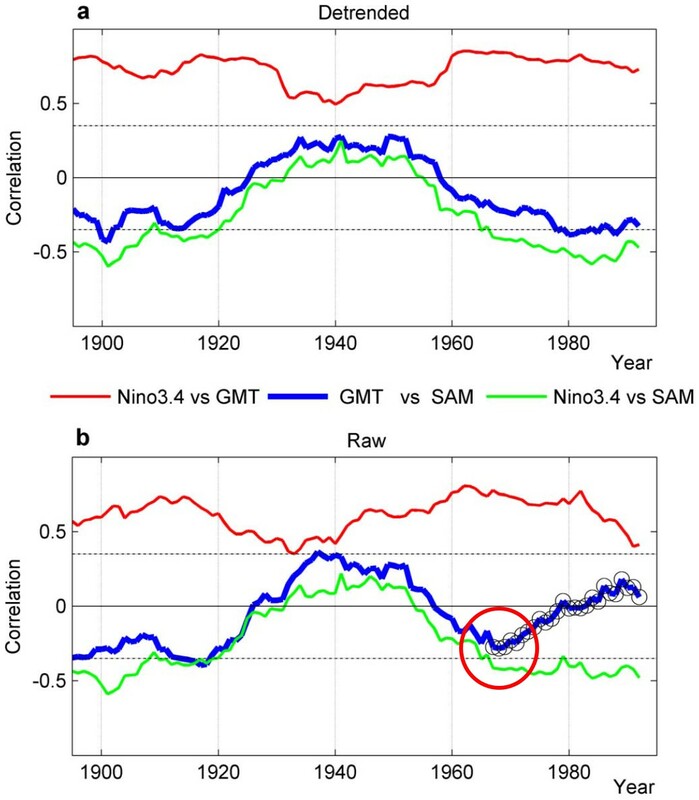 Roger Jones at Understanding Climate Risk has a post on global warming breaking the link between SAM and ENSO, with consequences for our weather. To help, GMT in the graph means ‘global mean temperature’. With the global warming signal taken out (top panel), the relationship between ENSO and SAM is strong but with it in, they depart in the late 1960s (lower panel). There’s also an article in The Age. So what does this mean for Australia’s climate? It means that an overwhelmingly positive SAM is keeping the westerlies south and contributing to our drier autumn winters and delivering weather typical of the Riverina to southern Victoria according to Cai. Recovery of the ozone layer and reduction in greenhouse gas emission would stabilise this process, rather than continuing to send it south. In summer it also allows the easterly trades greater access, bringing in more moisture from the tropics and enhancing La Niña summer rainfall. The Climate Commission has just released its report The Critical Decade 2013. It repeats what we already know: globally we can only release 1000 billion tonnes of CO2 between 2000 and 2050 to have a 75% chance of the temperature rising by 2°C. So far we’ve run through 40% of that budget, so in the next 37 years we have only 60% of that budget available. Consequently global emissions need to peak by 2020 and 80% of fossil fuel reserves need to be left in the ground. The ABC picked up on that last point. Our major parties say that’s well and good, but there are no implications for our coal export industry. As to Christine Milne, no need for me to tell you what she thinks! A National Food Plan White Paper was released last month. I’ve only had time for a quick skim, but it paints a rosy picture – we are going to grow more (30% more by 2025), manufacture more and export more food (45% more) in the future. Rebecca Lindberg and Mark Lawrence at the Conversation say more attention should have been paid to the 8% or 2 million Australians who are food deprived or food insecure. Andrew Longmire, research fellow with Beyond Zero Emissions, says the plan essentially ignores climate change. Agriculture is responsible for 16% of our emissions. These need to be minimised, we need to look to agriculture to store more carbon and account needs to be taken of the effect of climate change on landscapes and food productivity. The NFF and other industry groups welcome the emphasis on Asia. Radio National’s PM has more, not all of it positive. Ausveg wants more action on dumping by other countries. The Opposition are going to change the onus of proof on that one. Have they heard of the World Trade Organisation which makes the rules? The report cited several reasons for rising prices, including: increased demand for food and biofuels as a result of a growing population and higher incomes and standards of living, slower growth in food production, and rising energy costs. Limited water resources and farmland availability, as well as price hikes on necessities such as fertilizer, are expected to slow the increase in food production worldwide from 2.1 percent last decade (2003 – 2012) to 1.5 percent in the next decade. Meat, fish and biofuel prices are expected to rise more than fruit, vegetables and grains, but meat production is still expected to continue to expand, with China becoming the world’s largest consumer of pork by 2022. The report notes that “increasing environmental pressures” — which include climate change-fueled storms, drought and flooding — will be one of the main factors slowing the growth of food production around the world. From RN’s RN’s The World Today the World Bank has issued a dire warning about the impact of climate change on the world’s poor. In its revised Turn Down the Heat report, the World Bank says severe hardships will be felt within a generation and it says there’s a growing chance that warming will reach or exceed four degrees Celsius in this century. It finds many significant climate and development impacts are already being felt in some regions, and in some cases multiple threats of increasing extreme heat waves, sea-level rise, more severe storms, droughts and floods are expected to have further severe negative implications for the poorest. Climate-related extreme events could push households below the poverty trap threshold. High temperature extremes appear likely to affect yields of rice, wheat, maize and other important crops, adversely affecting food security. The left panel is 2°C and the right 4°C. In the unhatched areas 80% of the models agree, in the hatched areas 40% disagree. feature story. As well as a blog they have a topic site on climate change. fewer cyclones over the central Arctic Ocean during the months of May, June, and July appear to favor a low sea ice area at the end of the melt season. So cyclones early in the season may preserve ice cover. Last year there was a monster cyclone in early August which is thought to have contributed to the record melt in September. It is possible there will be more cyclones and these will provide a negative feedback to slow the trend of ice cover loss. There is a lot going on, however, and with the ice thinning they really don’t know what the impact is going to be short or long term. High impact biofuels such as those produced from grain and palm oil should be banned. Thanks for the Food Plan links …. a lot to digest there. Glad to see that some primary producers have done a 180-degree switch from their haughty neglect of Asian markets until only a few years ago …. too late …. the customers have already bought up some of the best farms …. Thanks for the link to your blog. Stick-in-the-mud economists and money-shufflers will whinge about the cost of renewable methanol-based fuel but the cost of not using this technology and of not developing it further is a heck of a lot higher. Besides, the Icelanders are not making this fuel for the Dutch out of charity. Very concerned about the threat of biofuels produced from old-growth woodchip, which must gain some kind of award as the Worst Idea of All Time. Although I’m very sad to see Rod Oakeshott go, his support for this terrible idea was a real worry. The saving grace for SE Australia’s old growth forest was the collapse in the export price for woodchips for paper. Now that someone’s had the bright idea of burning them for energy, we’ll be trapped in the same old routine of the forest industries lying to us about “using the waste” where in fact the industry is woodchip driven. Helen: Yep, woodchips are another one unless they really are bio-waste. Ditto other bright ideas that either divert food producing land, divert bio-waste that is needed to maintain soil quality or fuels that depend on trashing natural vegetation from marginal land. Brian: VW is putting out a car next year that consumes less than one litre/100 km. The owner of one of these cars would have to pay over $15/litre before the fuel bill would reach that of someone currently driving a n10 litre/100km car. ammonia price are competive or close to close to competitve with fossil fuels after allowing for the lower energy density of ammonia and methanol compared to diesel. These are prices for dirty ammonia and methanol produced using hydrogen from natural gas. Countries with cheap, clean hydro power have/are producing renewable ammonia and methanol using renewable hydrogen from electrolysis. Ew, can’t wait to be stopped at the lights on my bike behind an ammonia-burning vehicle. This is an over reaction, John. If starvation is being caused by land reassignment to fuels production then this is a political issue and usually related to extreme corruption by government officials (our example obeid being our example) and not a fault of the fuels, particularly palm oil. Robert Rapier has given a qualified thumbs up for palm oil, and that is not easy to get from him. Palm oil is a valuable contribution to the incomes of small mixed crop producers who plant out a portion of their land with these low maintenance trees for both shade and a marketable crop with a stable return. Palm trees in Arnheim land grow amoungst gum trees and other vegetation already. Palm oil production does not demand land clearing and monocrop production techniques. It is a very suitable cash crop for that part of the Australia which would of necessity have to be compatible with Aboriginal culture, as it is very much their land. Woodchip fuelled electricity is only ever going to be a niche application, relevant in Orbost and maybe Eden, nowhere else. The transport costs are far too high. Pretty much the same deal for crop residues. Maybe, just maybe, some crops specially grown for their calorific value to feed custom burners would make sense, where the grid requires a boost/backup, in distant regional areas, but mostly no, it’s not going to fly. Conversion to transport fuels would require effective lignin digestion, a technique that has been theoretically good for a long time, but has proven very hard to commercialise. Also of course, soil depletion is a real (though potentially manageable) issue. As for palm oil, it is possible to have sustainable production, though that isn’t the route that most producing countries have gone (quelle surprise). It will certainly have a role in future energy production. Helen: The combustion products of ammonia are water and nitrogen. One of the reason’s for being interested in using liquid ammonia. It can also be used in fuel cells either directly or as a source of hydrogen. Palm oil: Its production uses up land that could be used for fuel production or remain as part of the wild environment. I don’t see it as part of the solution for a world moving towards 9 billion people with a growing middle class. We also need to be looking for transportable fuel options to cover long distance air and sea travel as well as travel in places like our outback where more direct use of clean power is not going to be very practical. Brian: May be the next climate clippings could deal with Obama’s climate action plan There is a lot of good stuff there – most of which I haven’t read yet. Palm Oil got a very bad name because of the bulldozer-&-plantation method of producing it in some places. However, it is still a terrific crop in a non-destructive, village system. Permaculture, anyone? Timber-mill offcuts would make a good local raw-material for locally produced and used fuel so long as there are by-products/waste-products that can be put back in the local environment. A niche raw-material? Yes but if it works and does minimal harm, why not? Of course, you could simply tell the authorities to take a running jump and just use mill offcuts as solid fuel in vehicles converted to 21st century steam engines; steam technology has come a very long way since the Stanley Steamer and its kind. Brian: Would be good if you removed the last part of what I said at 8. Not sure how it got there. When I get time I’ll try to do a separate post on Obama’s plans. It may be instead of the next edition of CC. Bilb @6: Ban might be a bit too strong but high impact fuels should be phased out. Clean fuel quotas should be changed to include renewable, low impact fuels whether bio or not and exclude high impact fuels also bio or not. Not sure how to handle fuels that are made using not so clean power. My feeling at the moment is that we put most of our short term effort effort into cleaning electricity and rejig clean fuel quotas down to the point where we have the capacity to satisfy the demand without high impact renewables. It is the EU and US bio-fuel quotas in particular that are driving the damage at the moment. Corruption and unfair land ownership is merely responding to the quotas. Perhaps too much effort has been put into thinking about the Supply side of electricity and fuel but not enough into the Demand side. (I won’t be the first to have thought of that). Think of the drop in demand in such small matter as the changes from valve radios to transistor ones, from cathode ray tube TVs to LED flat screen ones, from tungsten-filament lightglobes to mini-fluorescent ones . Not huge amounts of electricity saved per individual household but such savings accumulated over the whole system. Of course, whatever was saved was soon blown again in other power-wasting toys-&-trinkets …. but don’t forget that the use of electricity was reduced, not increased, by a small amount with these three changes alone: there are possibilities of greater improvements if we set our minds to the tasks. It’s the way to go.